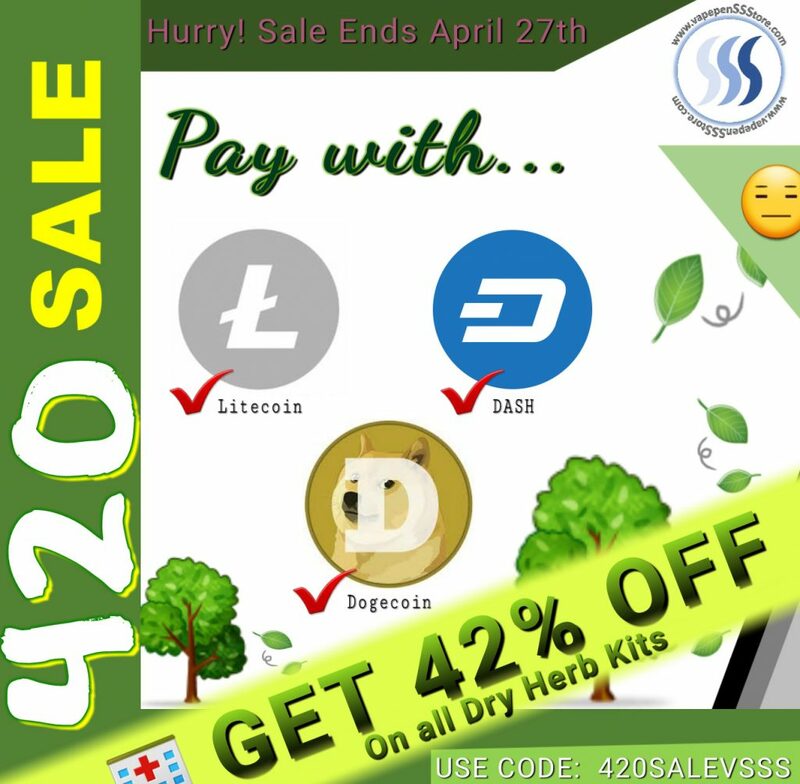 Right now through April 27th, get 42% OFF your purchase when buying any of our Dry Herb Kits by paying with Litecoin (LTC), Dash (DASH) or Dogecoin (DOGE). All you have to do is enter the 420SALEVSSS discount code at checkout when buying any of our Dry Herb Kits and your LTC / DASH / DOGE paid order will get an automatic 42% discount. Again, this sale is applicable to Dry Herb Kits Only while it lasts. This 420 SALE discount doesn’t apply to other SALE OFFERS or BUNDLES; it applies specifically, to Dry Herb Kits as displayed on our store. Cryptocurrencies such as Litecoin (LTC), Dash (DASH) and Dogecoin (DOGE) enable and favor small businesses like ours by providing a secure & affordable, platform through which transparent and trustworthy transactions can be made in a way similar to PayPal but without intermediaries or abusive credit card fees. 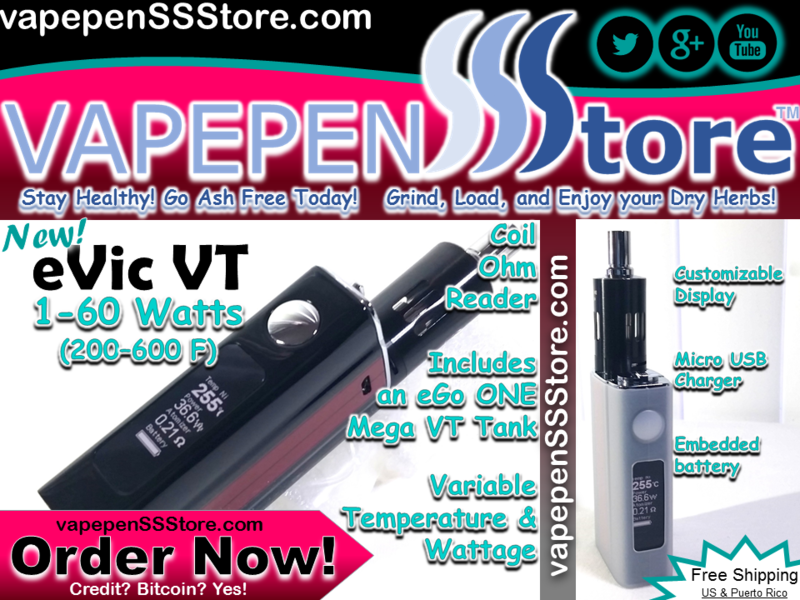 Starting November 23rd through December 2nd, get 50% OFF your purchase when buying any of our beautiful Tanks or MODs when you pay with Litecoin (LTC), Dash (DASH) or Dogecoin (DOGE). 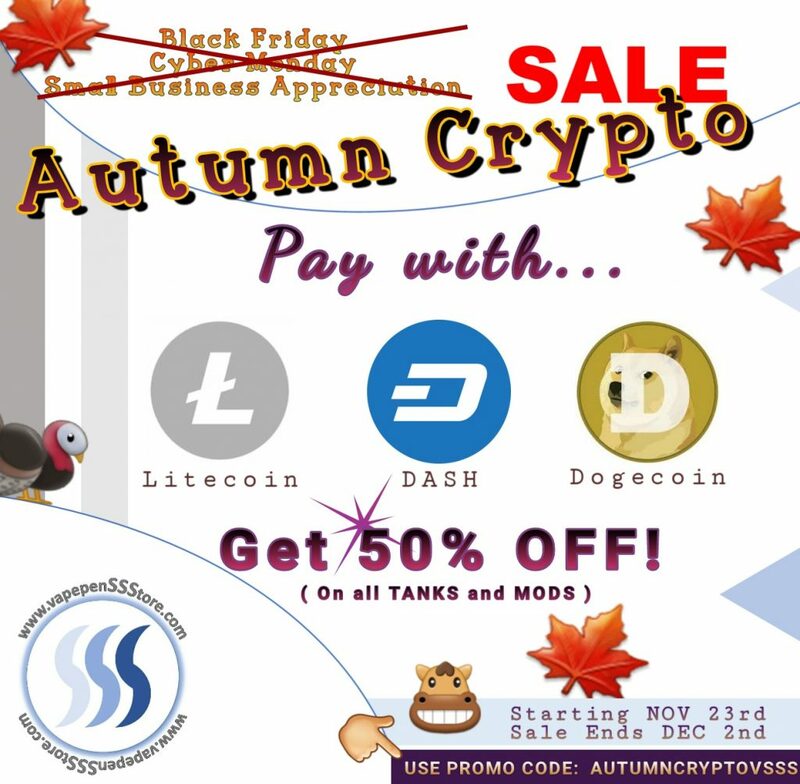 All you have to do is enter the AUTUMNCRYPTOVSSS discount code at checkout for any of our Tanks or MODs and your LTC / DASH / DOGE paid order will get an automatic 50% discount. Again, this sale is applicable to Tanks and MODs only while it lasts. This AUTUMN CRYPTO SALE discount doesn’t apply to other SALE OFFERS or BUNDLES; it applies specifically, to Tanks and MODs as displayed on our store. Right now, get 30% OFF your entire purchase when you pay for HERB and WAX Kits in our store using POTCOIN (POT). All you have to do is enter the POTCOINERS30 discount code at checkout for any of our HERB and Wax Kits and your POTCOIN paid order will get an automatic 30% discount. Again, this sale is applicable to HERB and WAX Kits only while it lasts. 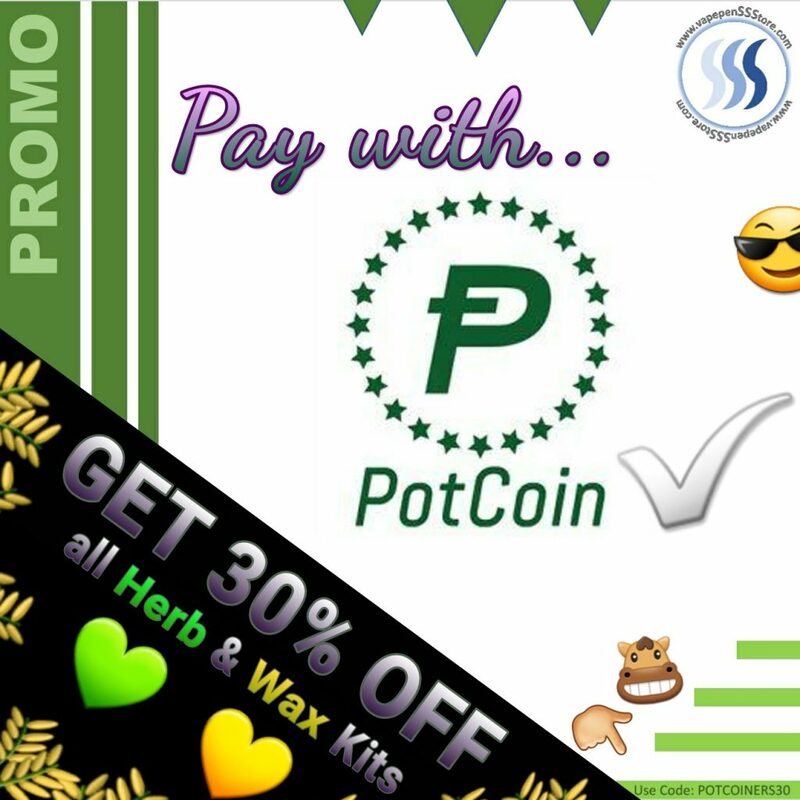 This POTCOIN PROMO doesn’t apply to other SALE OFFERS or BUNDLES; it applies specifically, to HERB and WAX Kits as displayed on our store. Cryptocurrencies such as POTCOIN enable and favor small businesses like ours by providing a secure & affordable, platform through which transparent and trustworthy transactions can be made in a way similar to PayPal but without intermediaries or abusive credit card fees. Hello, you’ve come at the right time! Although we don’t necessarily have this sale going on right now, you can sign up with us so you won’t miss the next one. 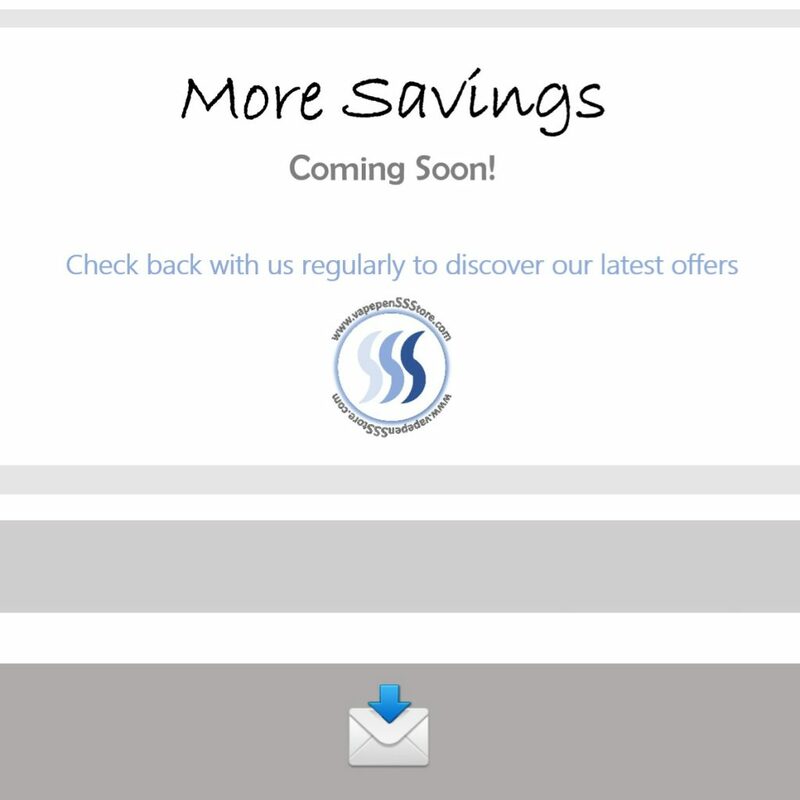 If you would like to sign up to our newsletter to get the latest on our product promotions, sales or other events regarding our store / services please sign up here. Remember, whenever we advertise some kind of SALE, keep in mind, you’ll be saving $$$ with us! Using the DarkKnight SPIRIT Vaporizer is extremely simple. 5 – Press the unit’s activation button 5 times withing 2 seconds to turn the unit ON. The unit’s Red and Blue LEDs should light up brightly at this time. 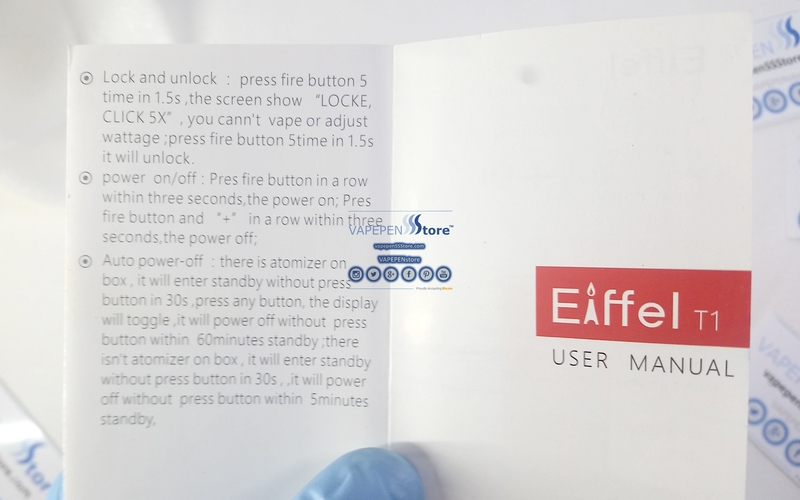 6 – Press and hold the units ON button to vaporizer your media. Note: The unit has an overheat protection function built in. 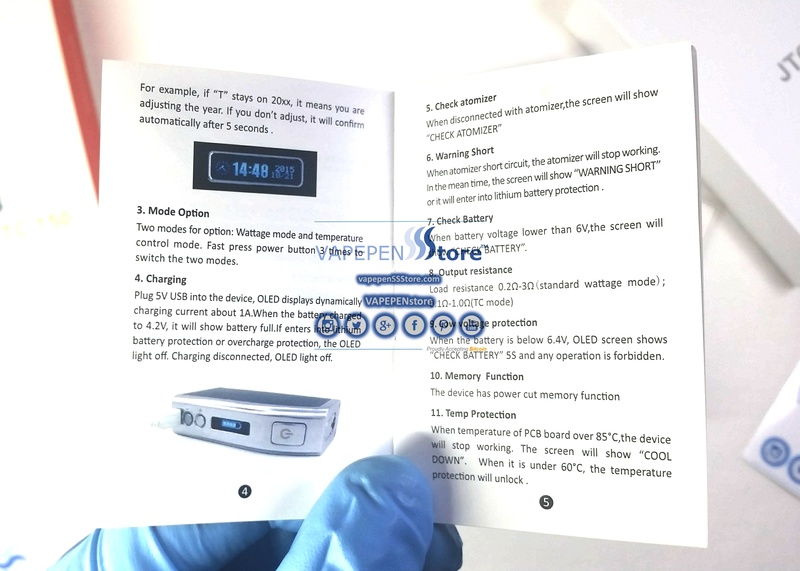 This will automatically de-activate the unit from heating its atomizer if the atomizer is kept ON continuously for more than 15 seconds. 7 – Press the unit’s activation button 5 times withing 2 seconds once again to turn the unit OFF. The unit’s LEDs should light up brightly and remain off to indicate the unit has been shut down. 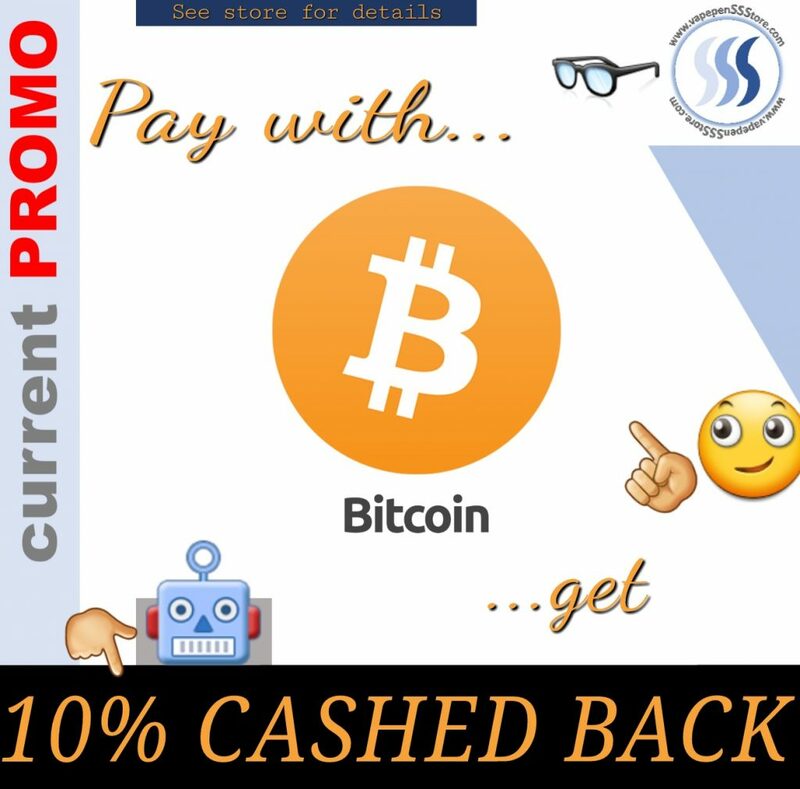 Right now, get 10% Cashed Back your entire purchase when you pay with BITCOIN. Once you do you will be automatically enrolled in our 10% Cashed Back Offer program. After an order using BITCOIN goes through, we will subsequently, send a cash equivalent of 10% OFF the entire order to the BITCOIN WALLET ADDRESS used when the purchase was made. Simple… we transfer you 10% cash back. We are committed to make the BITCOIN 10% Cashed Back transfer within 14 days from the date when the order was made. BITCOIN enables and favors small businesses like ours by providing a secure & affordable, platform through which transparent and trustworthy transactions can be made in a way similar to PayPal but without intermediaries. 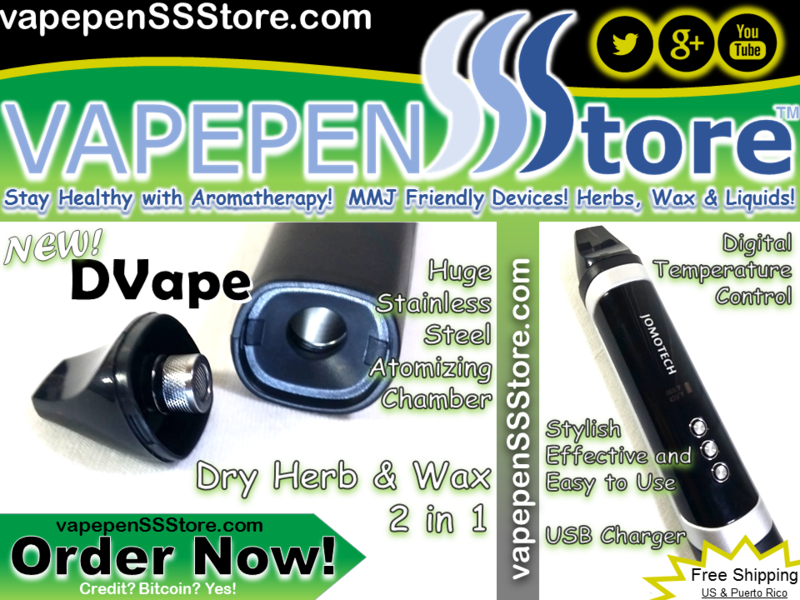 Using the DVape 2in1 Vaporizer is extremely simple. 1 – Load your media in the unit’s atomizing chamber. 2 – By using the up or down temperature adjustment buttons, set your operating temperature of preference as shown in the unit’s LCD Display. 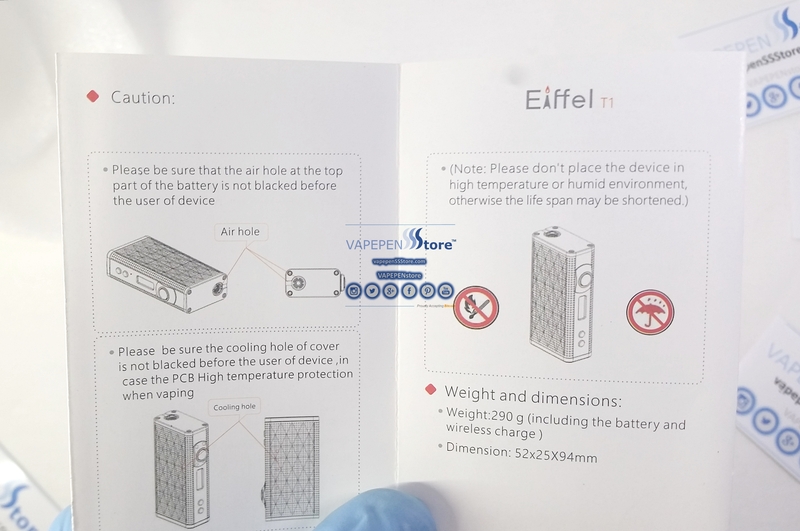 3 – Once you have entered your temperature setting simply press the activation button and stand by until the hourglass status indicator turns to active status, meaning the desired temperature has been reached, and then simply enjoy great vapor. Locking the unit off is as simple as repeatedly pressing the activation 5 times. To unlock the unit for use once again, press the activation button again 5 times. 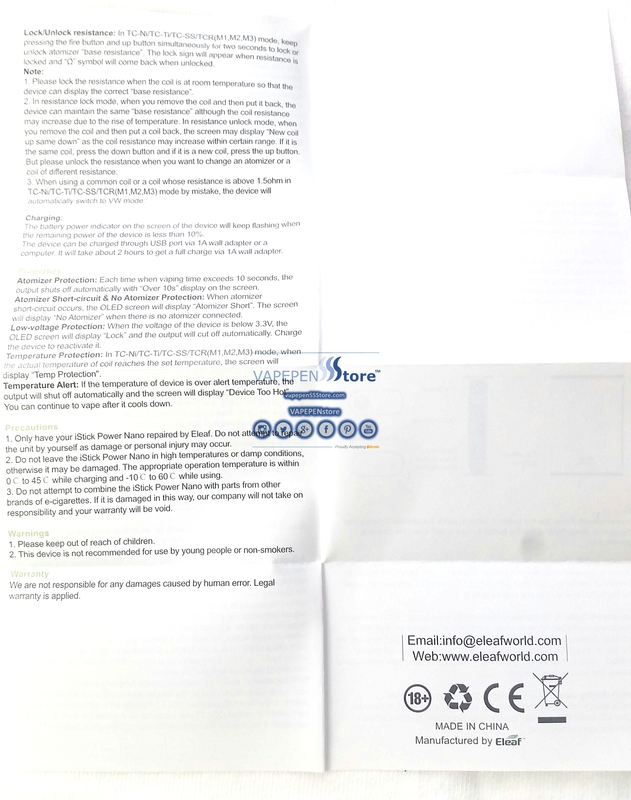 Further features are fully described in the product’s manual. Operating this unit is easy. With a simple and discrete selection knob the unit is designed to effortlessly allow you to browse through the MODs many features. 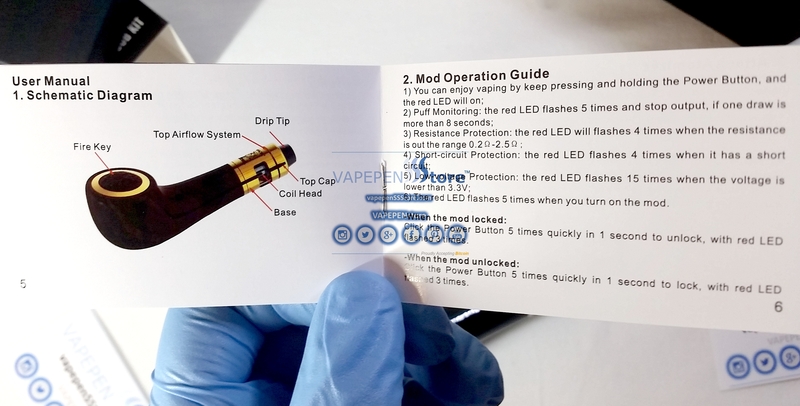 Follow these instructions when using the eVic VT.
1 – To turn ON the MOD press its activation button 5 times. 2 – To use the MOD simply press and hold the activation button during operation. – A stealth mode is available through which you may use the MOD with its LED display turned off. To enable this feature press the unit’s activation button and simultaneously turn the selection knob left for Stealth ON turn left again for Stealth Off. – This feature allows the unit to prevent accidental VT / VW adjustments when the form pressing the selection knob inadvertently. To enable this feature simple press the activation button and simultaneously turn the selection knob left for Adjustment Lock ON turn left again for Adjustment Lock Off. Further features such as shifting between the special VT – Ni, VT – Ti, and VW Modes as well as unit specific safety modes (Temp protection, Temp alert, Atomizer Replacement, Atomizer, Short Circuit Protection, etc.) 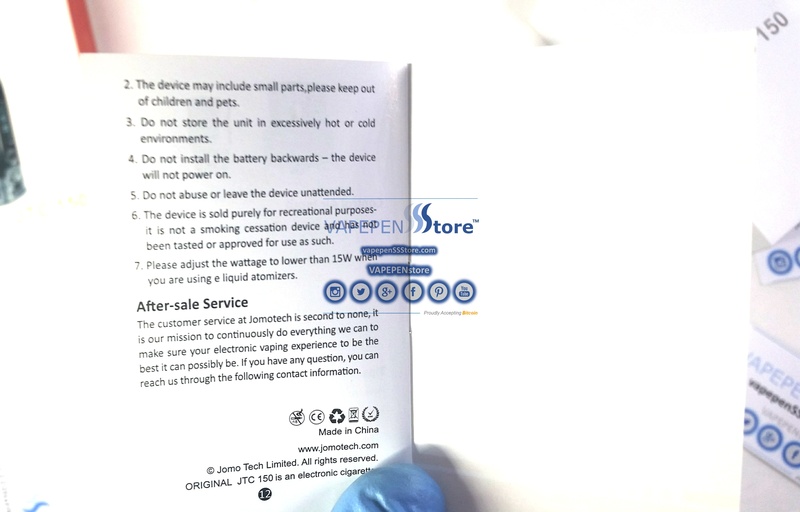 are all fully described in the product’s manual. 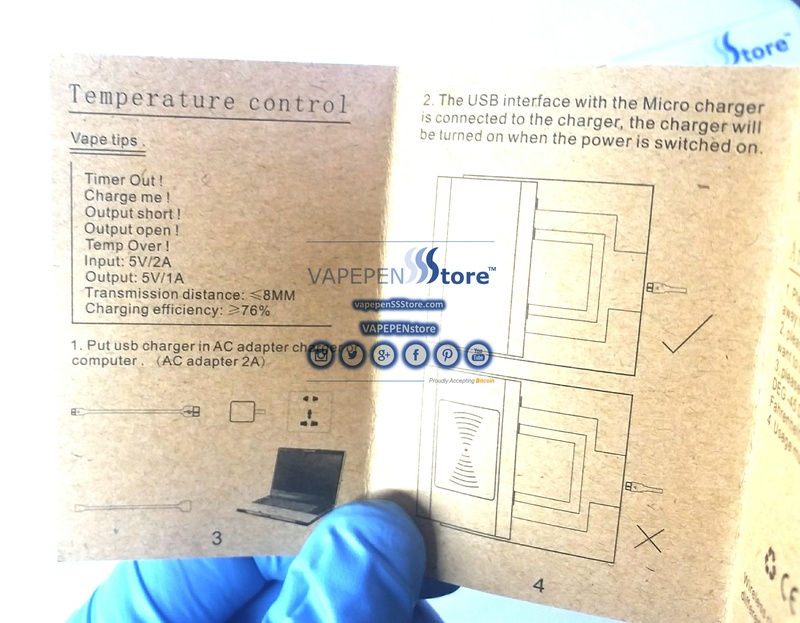 Using the TREEBOX mini MOD is easy and systematic. 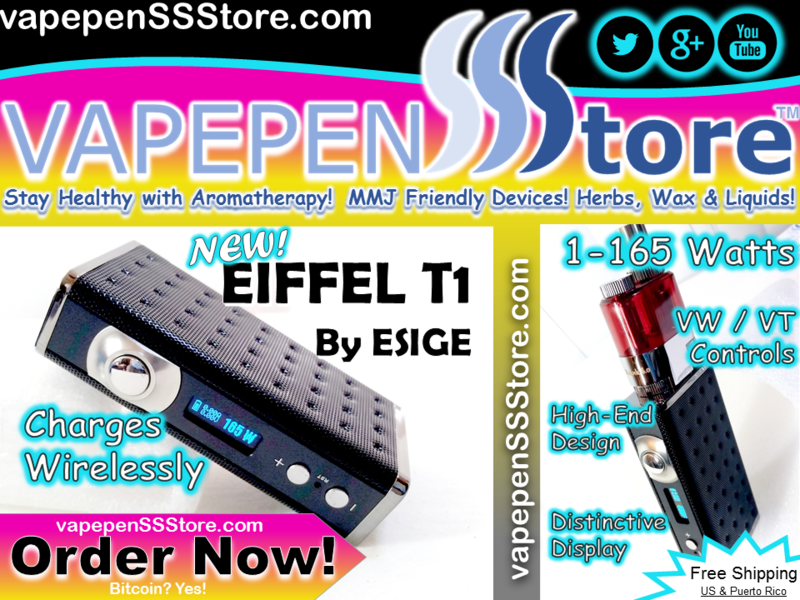 1 – Load your battery in the MOD. 2 – To turn ON the MOD press its activation button 5 times. 3 – To use the MOD simply press and hold the activation button during operation. 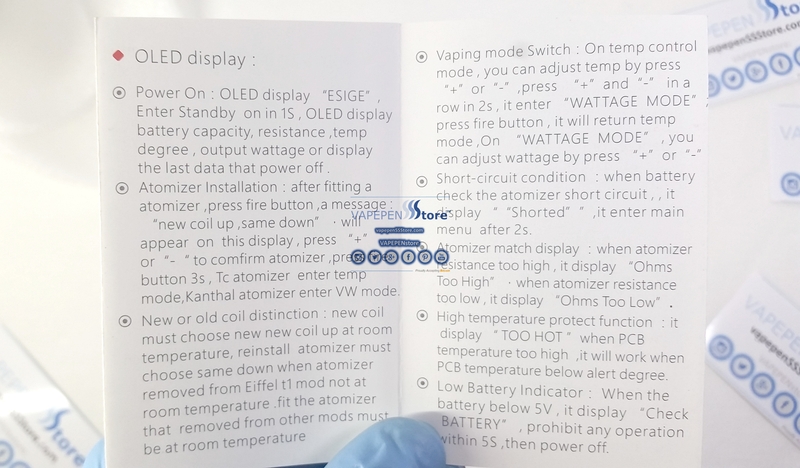 If no atomizer is connected, the MOD will show “NO ATOMIZER” in its display. Note: The unit has an operation protection feature that will force the device to stop if the activation button is held active for more than 12 seconds. Also note that if the unit is left idle for more than 5 minutes it will shut itself down. 4 – Like with most MODs pressing the buttons below the display will allow for temperature or wattage control. 5 – At any time during TC or VW operation pressing the activation button 3 times in 2 seconds will enter the MOD into its operation menu. Long pressing the activation button during this time enables menu options selection. 6 – At any time during TC or VW mode pressing both buttons below the display simultaneously will lock the device to avoid accidental operation. To undo this setting both buttons need to be pressed simultaneously again. 1 – Pressing the power button and the first button below the display simultaneously allows for the display to be rotated from left to right. 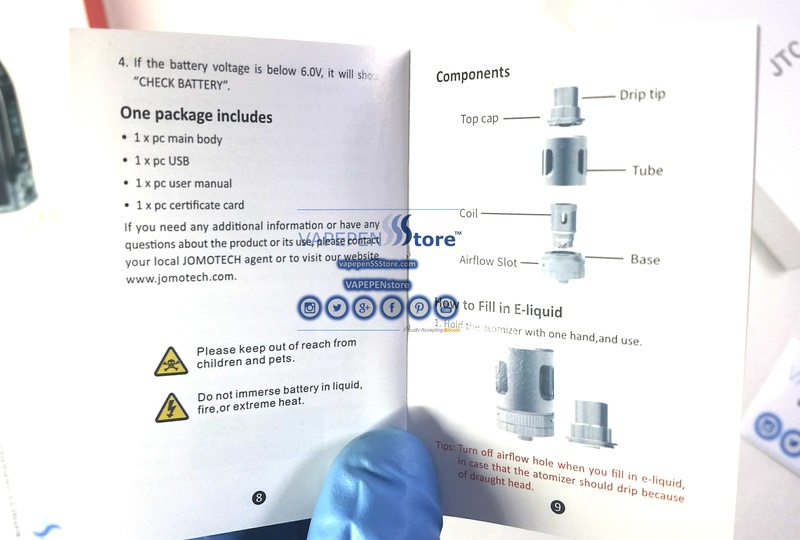 2 – Pressing the power button and the second button below the display allows for the resistance of the atomizer being used to be saved into the device’s memory. 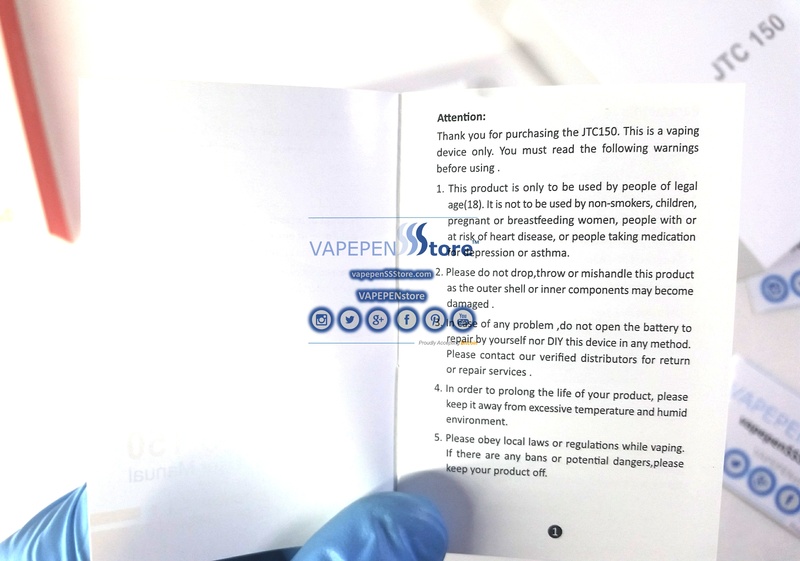 2 – While in TC mode pressing the activation button and the second button below the display simultaneously will allow for the selection three different vape settings defined as NORMAL, HARD or SOFT. 3 – While in TC mode Coil Material type may be selected from the operations menu. 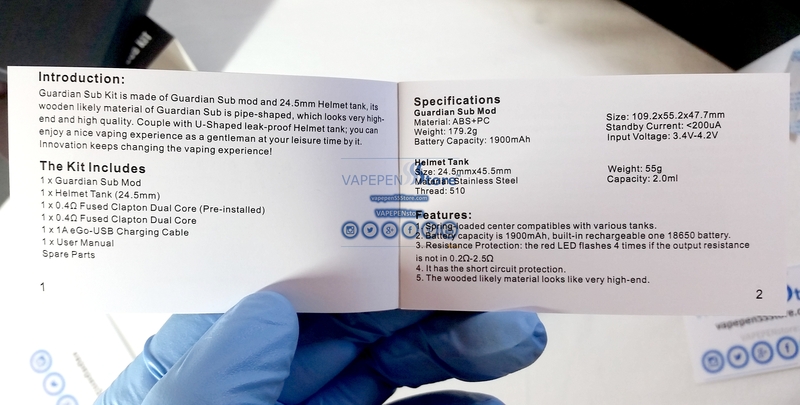 The MOD allows for Nickel, Titanium and Stainless Steel coil specific types for more precise and efficient use. 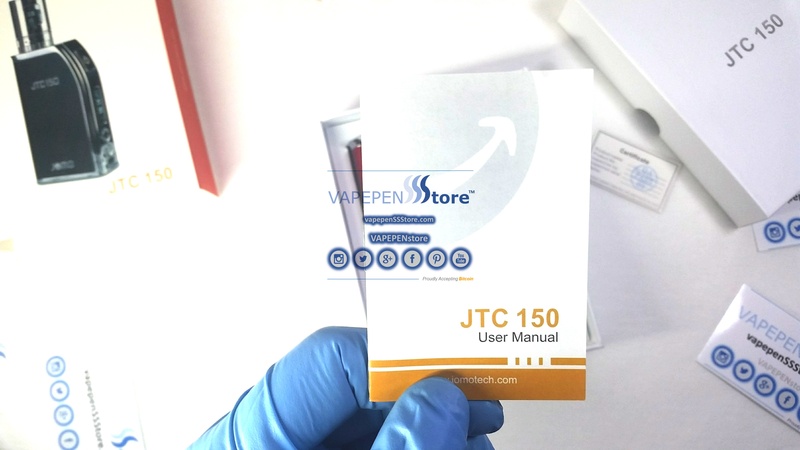 4 – Also while in TC mode the operations menu allows for a Temperature Coefficient of Resistance (TCR) setting to be adjusted that will further improve the operating temperature on the MOD per the coil being used so that the best tasting vapor is achieved. 5 – Finally, TC mode also allows for an Adjustable Initial Resistance setting where the MOD may be set with an atomizer initial resistance providing for even further customized operation. 6 – Turning the unit OFF is as simple as pressing the activation button 5 times. Note: The TREEBOX mini is also full of safety features that are specified on the unit’s manual. Batteries are NOT included with this unit. One 18650 Battery is recommended for use. Using the Asolo MOD is easy and systematic. 1 – Load your batteries in the MOD. Note: By pressing the T button, the unit will switch between its VW (Variable Wattage) and TC (Temperature Control) modes. 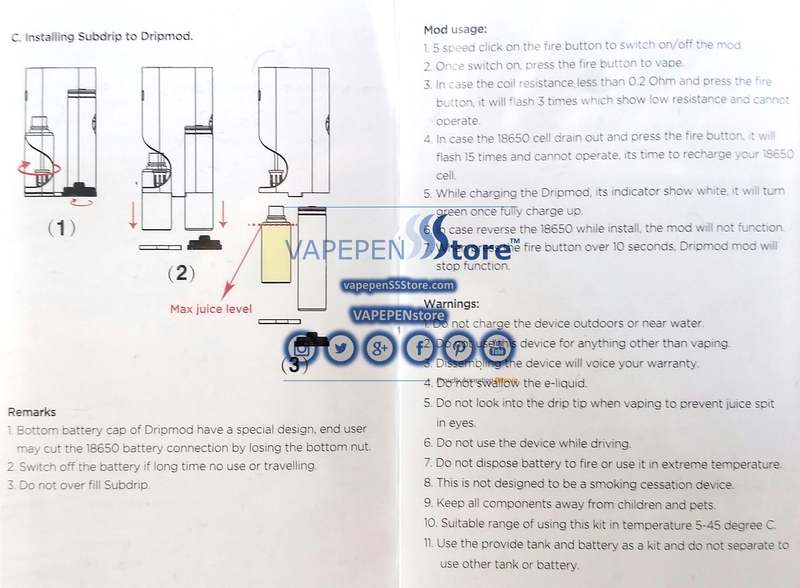 During TC mode the unit will operates as a SMART DEVICE effectively LEARNING how to most efficiently energize the connected atomizer of choice to provide you with the best tasting vapor possible. 4 – While in TC mode pressing the + or the – on the T button will allow you to operate as HARD or SOFT modes which increase or decrease the SMART operating temperature of the MOD by increasing or decreasing the temperature through percentage increments. 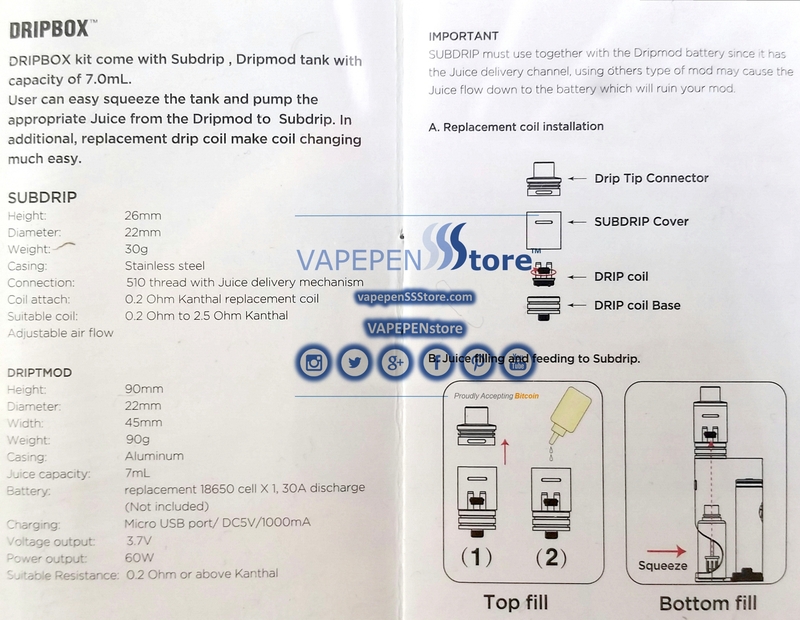 Note: The unit is also capable to store in memory what it learned from the Atomizers being used so that as you switch your atomizers it can adjust back to previously LEARNED coils based on their specific resistance. 5 – This MOD also runs Titanium and Nickel Modes. For these modes simply press the T button three times and a selection screen will appear on the unit’s display. Then select your desired temperatures and modes by pressing the + or – on the T button. 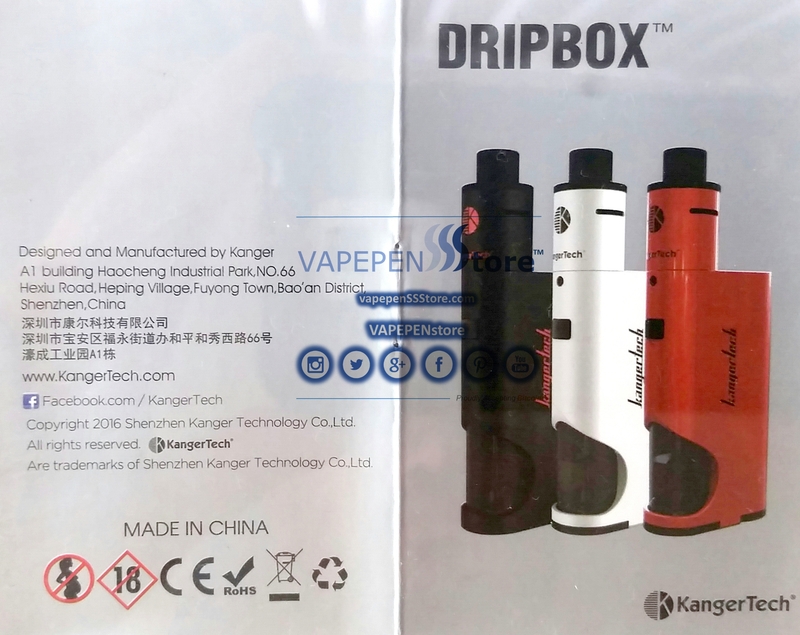 6 – Further, the unit has a “Dry Hit” or E-Liquid sensing feature that will stop the unit from working if you run out of eJuice half way or prior to inhaling your vapor. This feature makes the SMART device SAFE as well. A MOD first. 7 – Finally the MOD has a PASSWORD function that will secure your device at all times making it, along with all its features and modes, the most sophisticated MOD available on the the market today. 8 – To turn the unit OFF press the activation button 5 times. 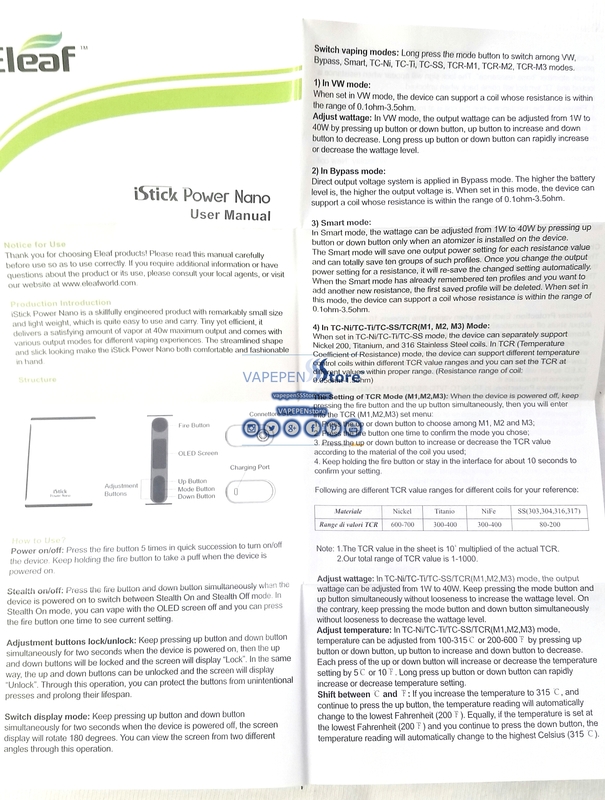 Note: More information and details are found on the unit’s Manual. Batteries are NOT included with this unit. 18650 Batteries are recommended. 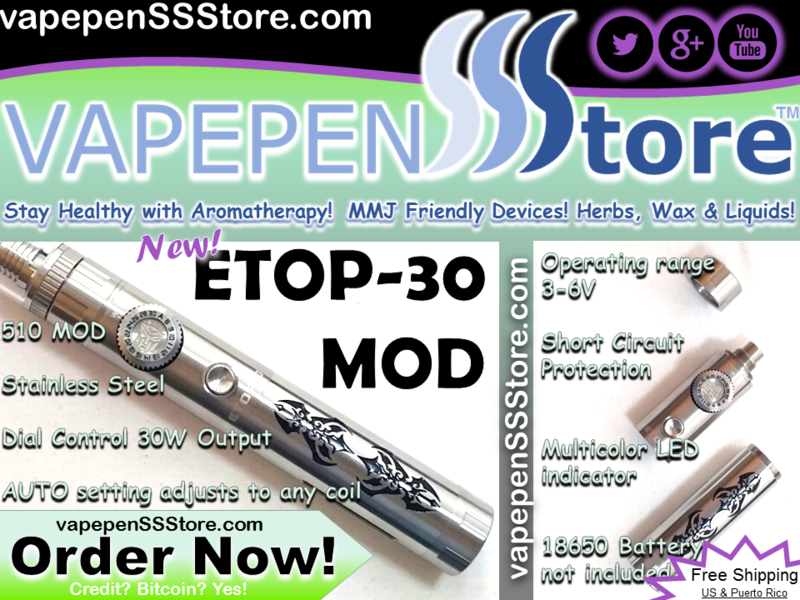 Using the ETOP 30 510 MOD is easy and systematic. 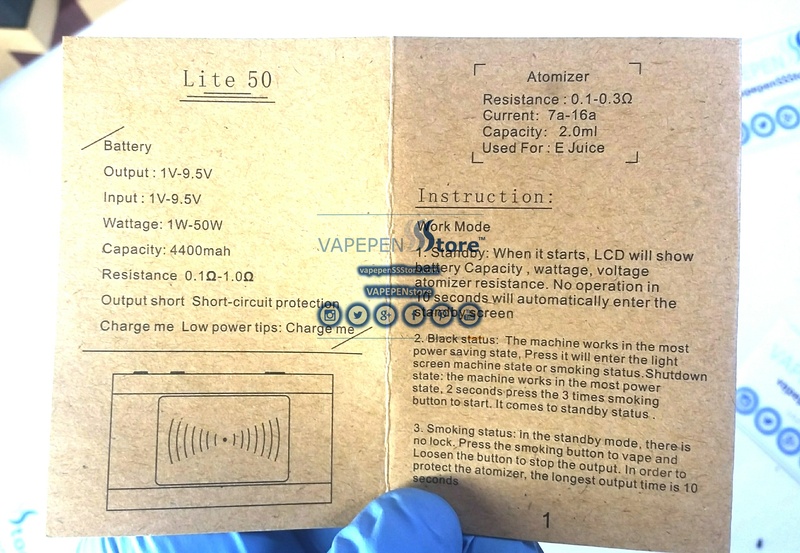 1 – When you load your battery the MOD will flash its LED light in white color once to indicate the battery has been loaded correctly. 2 – To turn ON the MOD press its activation button 5 times. Once you do its LED light will flash 3 times in white color. 3 – To use the MOD simply press and hold the activation button during operation. Note: By rotating the dial you may manually adjust your unit’s output power from 8-30W. With every successfull selection the MOD LED light will flash. 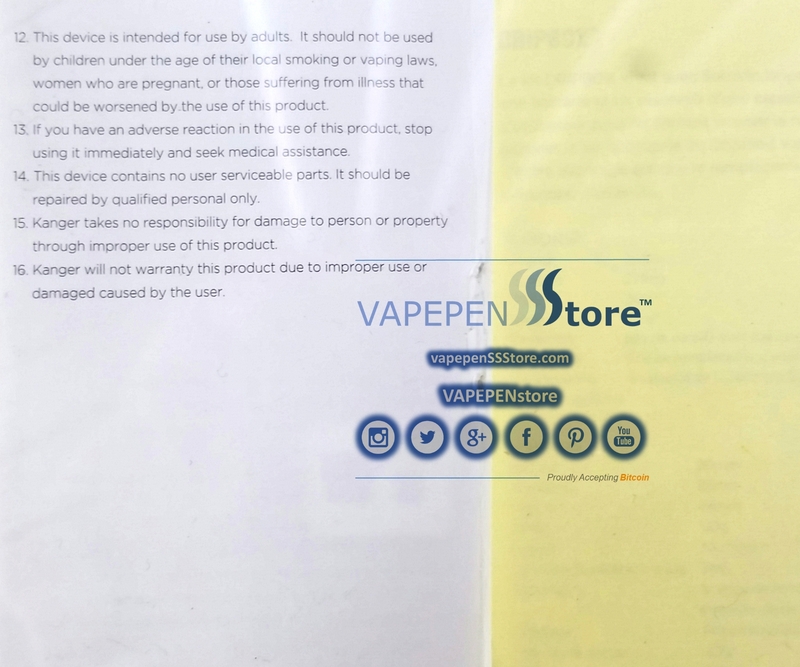 If A is selected the MOD will AUTOMATICALLY adjust its output power to suit whatever atomizer is connected to the unit. 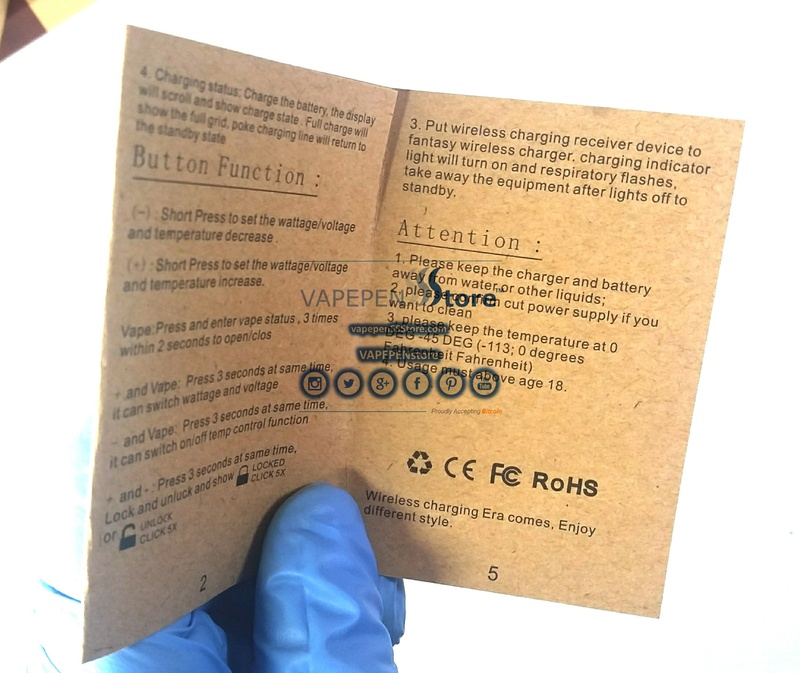 4 – The unit is also designed to notify the user what is the remaining status of its battery. The LED light will flash in different colors depending on battery power. 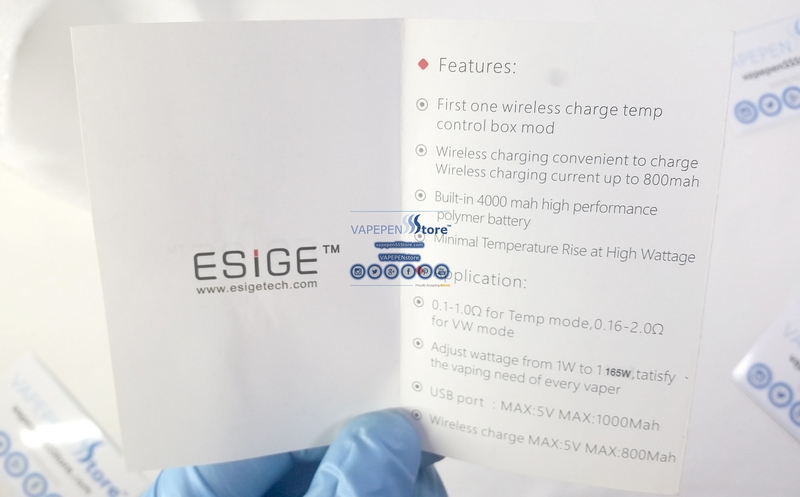 Note: When the battery voltage is less than 3.3V the LED will flash RED 10 times indicating its time to recharge the battery. 5 – To turn the unit off press the activation button 5 times. Its LED ligth will flash 3 times in white color to indication that the unit has been turned off. Battery is NOT included with this unit. 18650 Battery is recommended. 1 – Press the activation botton FIVE times and the light around the activation button will flash BLUE 5 times indicating the unit is “ON”. 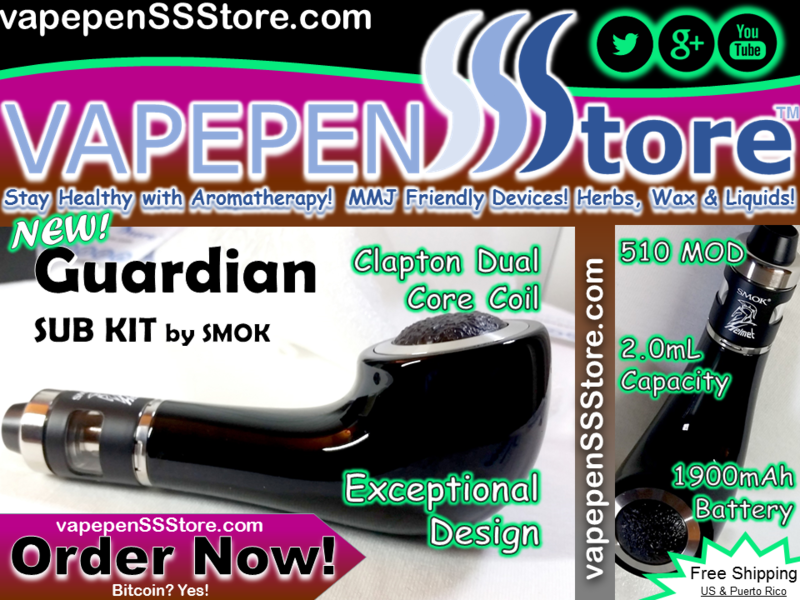 2 – Once you have shatterd your wax into vaporizing chamber. 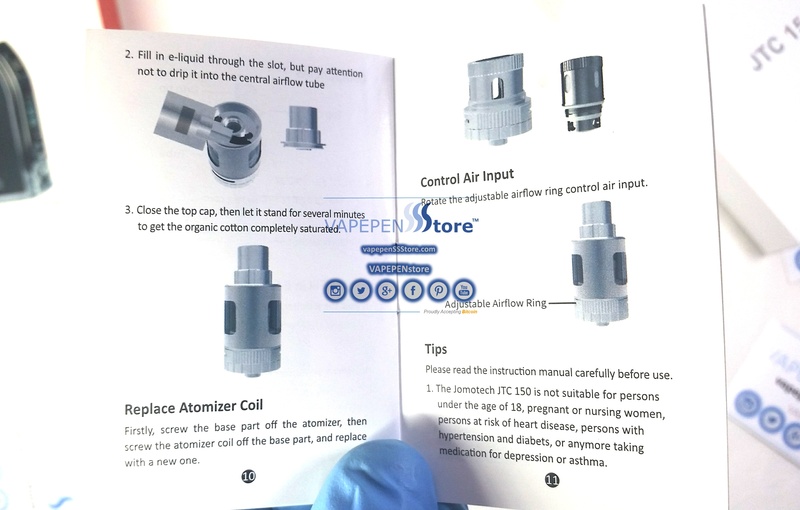 3 – Close the vaporizing chamber by reinserting the glass mouthpiece on the atomizer. 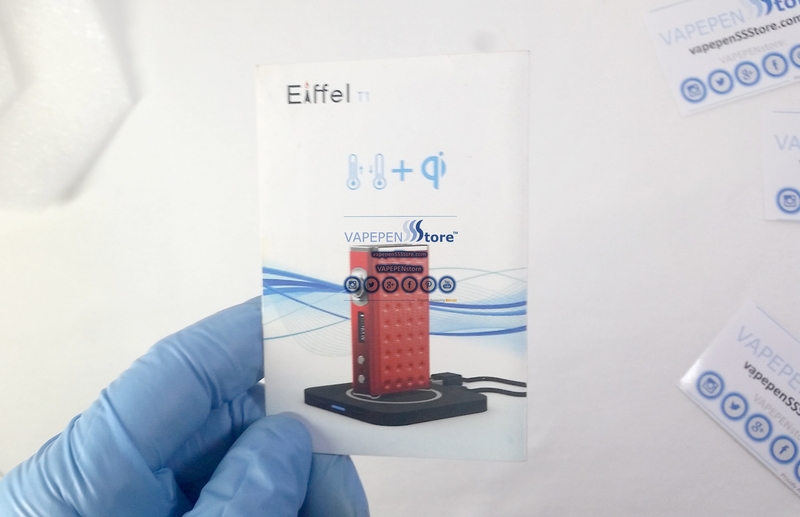 4 – Activate the heating element of the vaporizer by keeping the activation button pressed. 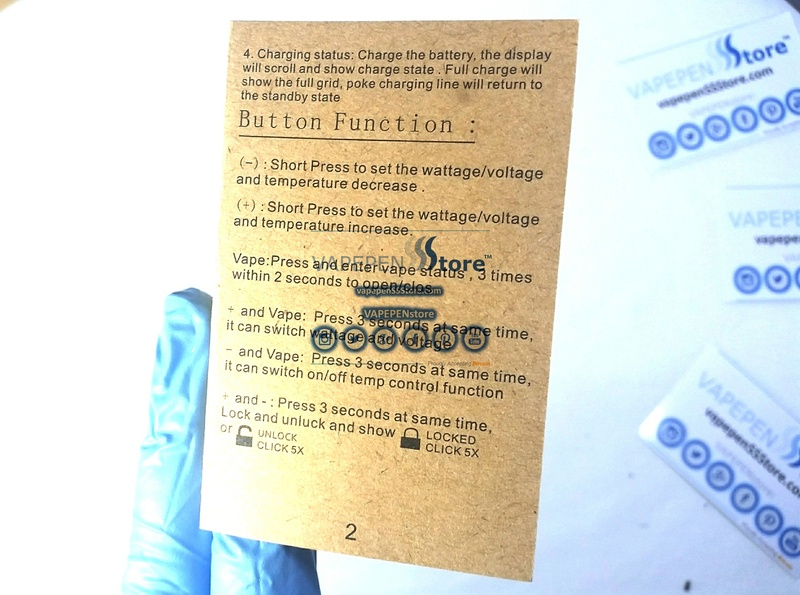 While the button remains pressed the vaporizer will gradually heat Wax until it is slowly vaporized. 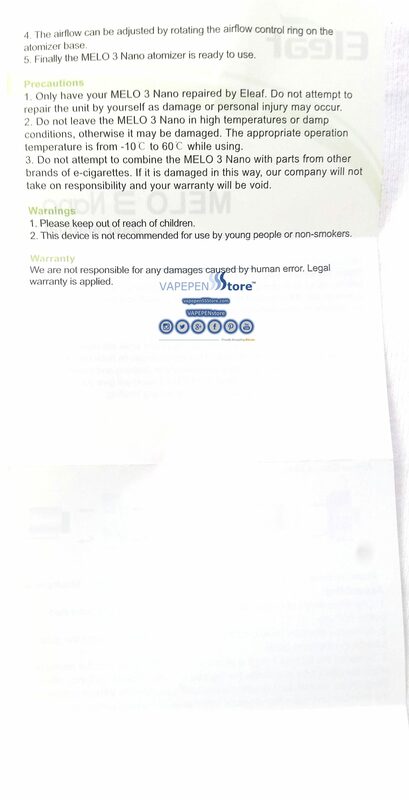 5 – Proceed to inhale through the mouthpiece while the button is pressed until you consume all the vapor. 6 – Once you have consumed all your herb unplug the mouthpiecce and use the cleaning brush provided to clean the chamber. Note: Before recharging the vaporizer be sure to bring to its OFF state by pressing the activation button FIVE times. 1 – Be sure the vaporizer is turned off. 2 – Unplug the mouthpiece and remove the units atomizer as needed. 3 – Use boiling water to remove any leftover wax from the atomizer. Do this as needed so that all remaining residues are removed and air flow and heat exchange is restored. 4 – Allow all components to dry at room temperature. 5 – Once the components are dry reassemble them back together. 6 – Finally proceed to follow the STEPS FOR DAILY USE. Note: Typically ROUTINE MAINTENACE is required once a month dependant of use. 1 – Load your grinded herbs in the units vaporizing chamber. Then remove water lid to fill the unit with distilled water. 2 – To turn on the FALCON unit press its activation button. 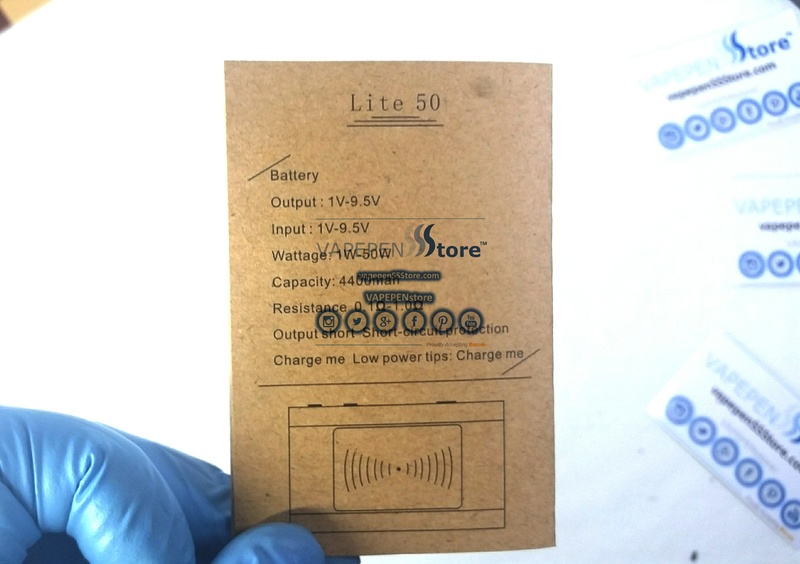 Initially the LED bar on the back of the unit will display the remaining battery charge level. 3 – By pressing the activation button once again you will be able to select one of the 5 preset temperature settings. 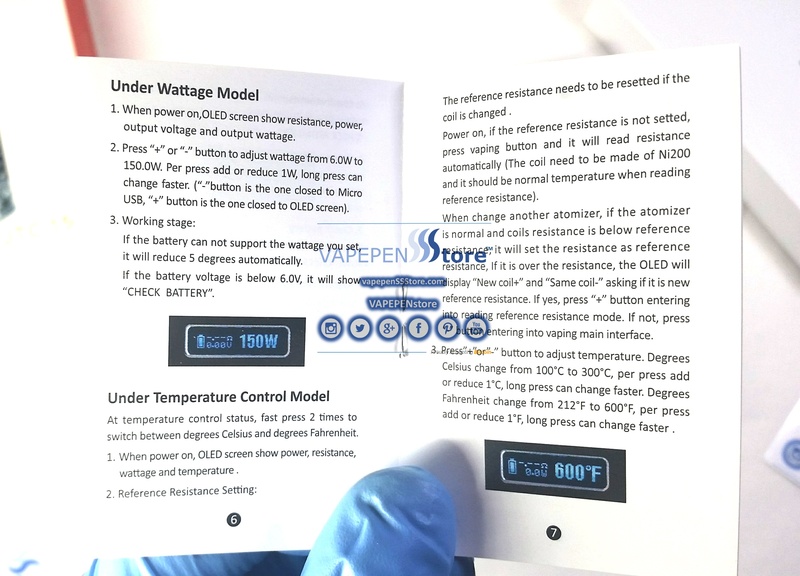 4 – Once the desired temperature pre set is selected the vaporizer will flash its LED lights until the desired temperature is reached. After this the vaporizer LED light will remain iluminated in the corresponding color of the temperature pre set selected. 5 – To shut down the unit press and hold its activation button until the units LED lights turn off. 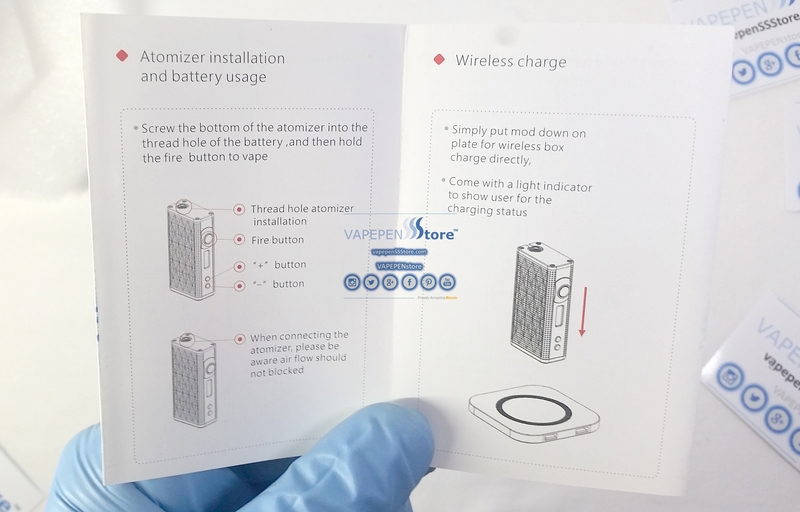 1 – Use the cleaning brush included with the unit to remove any spent herb from its vaporizing chamber. 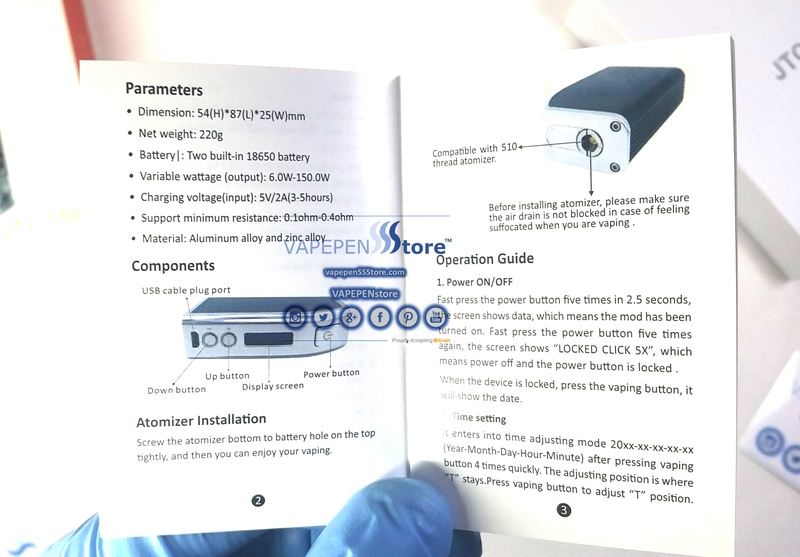 2 – Use the unit’s Allen tool to unmount the bottom end of the vaporizer. Once you do proceed to clean its water tank. It is recommended to clean the water tank at least once a week.